Upcoming and recently-published books of Irish and Irish American interest. Recently-published and upcoming books of Irish and Irish American interest. Great Moments In Hurling from Sportsfile is the ultimate visual history of the modern game of hurling, its major characters, and stories, beginning with the legendary era of the 1950s. Sportsfile, founded by Ray McManus in the 1980s, is the leading sports photography agency that covers every Irish sporting event, whether it be international competitions like the Olympics, Ireland’s national sports like hurling, and even localized sporting competitions. Ray McManus and his Sportsfile team has attended and covered every All-Ireland final, both hurling and Gaelic football since 1980. This experience has enabled Sportsfile to photograph moments both iconic, and not as iconic that should be recognized nonetheless, which is what Great Moments In Hurling accomplishes from page one. The photographs in the book exhibit the various emotions that one feels not only playing the sport of hurling but the emotions that the fans go through as they follow their club and county year after year. These photographs also produce a timeline of the evolution of the game with the expansion of stadiums, the introduction of helmets, and bigger bás, the curved front of the hurley stick. Those with a keen eye will see the changes of the game in its action and infrastructure throughout the book. In addition to the visual aspects of the book, there are some great passages and stories included from both photographers and their subjects. One of the most famous passages is a section of Galway captain Joe Connolly’s speech after he lead his side to their second All-Ireland victory in 1980. Another one of these passages details what happened after the photograph was taken. This particular photograph centers on a Waterford hurler feeling dejected after his team lost to Tipperary in 2015, in the foreground you can see the player crouched down, in the background however, you can see two players from Tipperary making their way over to console their opponent. Great Moments In Hurling is a brilliant showcase in which both diehard fans of the ancient game and new fans alike could delight in the glory and the hardships that hurling players and fans endure year after year. Stella and Gerry, like any couple who have been together for decades, have their own ways of dealing with each other. He reluctantly agrees to tolerate the importance of religion in her life; she pretends to ignore his drinking. At times, she seems to despise him. He loves her deeply, but is bewildered by her need for something “other.” And yet, they are good together. There is so much common ground – years of shared humor and amusing shorthand for the physical foibles of middle age. A break in Amsterdam sees Gerry desperately and surreptitiously trying to maintain his comfort zone (at the bottom of a whiskey bottle), while Stella is on a mission to see if she can secure a safe harbor from the vicissitudes of this fractured relationship. The reader, meanwhile, is the silent audience for Gerry’s late-night musings about the couple’s early life in Belfast, and the events that drove them across the water to Glasgow. As an architect, Gerry resentfully views much of the Troubles in terms of the destruction of buildings; as a teacher, Stella questions everything – her part in the world, her life, and her overwhelming emotional reaction to Anne Frank’s house which led to a ham-fisted attempt at paying a tribute she later chastised herself for. This is MacLaverty’s first novel in 16 years, and it is a beautifully-written triumph. At one point towards the end of the book, Gerry lists all of Stella’s most impressive characteristics and achievements, the one fly in the ointment being her insistence on spelling carrots with two t’s. It is a declaration of love equal to any of Shakespeare’s flowery sonnets, and far more real. Hopefully we won’t have to wait another 16 years for another. Set in early 20th-century Brooklyn, The Ninth Hour focuses on the widowed Annie, an Irish immigrant who moved to New York for the man who would make her a widow, and her daughter, Sally, as told, in part, by Sally’s own children. Following her husband’s suicide, Annie is taken in by the Little Sisters of the Sick and Poor at the behest of Sister St. Savior, a matter-of-fact elder nun who knows a woman in need when she sees one and doesn’t worry so much about Church rules as she does about what simply needs doing for the down-and-out. Sally grows up in the convent’s laundry, exposed to the matter-of-fact grime the human body produces on a daily basis and, once she is older, to the realities of nursing the sick and poor. This premise McDermott turns into a sublime study of faith, sin, virtue, and doubt, weaving these themes beautifully with the corporeal reality of bodily function and human hesitation and folly. Towards the end of the novel, McDermott, who won the National Book Award in 2013 for her novel Someone and has been a finalist for the Pulitzer Prize three times in as many decades, writes, “History was easy: the past with all loss burned out of it, all sorrow worn out of it – all that was merely personal comfortably removed.” The Ninth Hour is a stunning and intimate depiction of an era that has passed, all-too-easily, from reality to memory, reminding us that the uncomfortably personal has existed long before us, and will continue long afterwards. The Devil’s Half Mile. 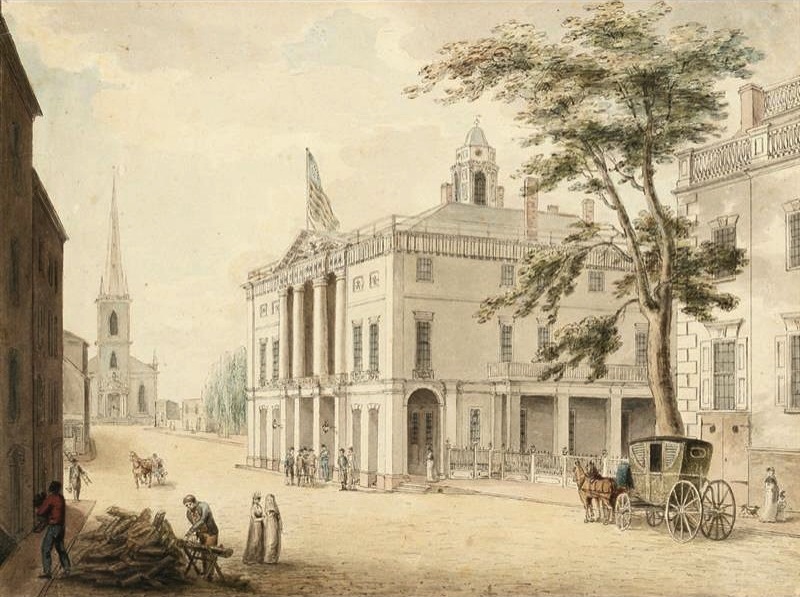 A view down Wall Street, c. 1798, by Archibald Richardson. Award-winning financial journalist Paddy Hirsch, whose commentaries on the economy as senior producer of NPR’s Marketplace reveal an intimate knowledge of the twists and turns of today’s markets, takes us back to 1799 Wall Street, the source of the title of his novel The Devil’s Half Mile. Part thriller, part love story and part cautionary tale, this page-turner also carries intimations of the future. Alexander Hamilton feared that the financial crisis of 1792 would destroy the fledgling United States and yet the bankers and traders Hirsch introduces us to care only about manipulating the system for their own profit. There are a few honest men. One of them, Frances Flanagan, was driven to suicide by the part he played in a financial scam – what did he really kill him self? Enter his son Justice Flanagan (Justy), educated as a lawyer at the newly open St. Patrick’s College Maynooth, one of the few places in Ireland open Catholic students, he returns to New York determined to avenge himself on those who involved his father in the financial scheme. Justy, who fought with the Defenders against the British in the Rebellion of 1798, finds he must battle the same kind of prejudice against the Irish among the Wall Street traders. But he has powerful allies in his uncle, Ignatius the Bull, boss of the criminal underworld, and Kerry O’Toole, the mixed-race daughter of an Irish father and free woman of color. One of the features of old New York in The Devil’s Half Mile is the interaction between the Irish and black communities who shared the same neighborhoods. Hirsch’s portrait of a city struggling to be born is vivid and part of the fun is comparing it to today’s New York. Amazing that this cluster of muddy, odorous streets with its rag-tag population could become the greatest city in the world. Hirsch says that he started out to write a history book, but found himself introducing a murder and watching as his fictional characters pushed out Alexander Hamilton and Aaron Burr, though both men make cameo experiences. “I really really wanted to tell a story,” Hirsch says. And he does – an exciting one – but you can’t read it without thinking of today. As Hirsch says in an after note, “Many people might look back at those days wistfully; it’s certainly easy enough to find Wall Street players happy to argue that banks and investment houses can regulate themselves and government should just get out of the way. Unfortunately, experience has proved that a poorly regulated system is too easily abused, and that cynical bankers and traders – whether frock-coated and bewigged in 1799 or clad in business casual today – are quite willing to abuse it. The Devils Half Mile is available now for pre-order with an official publication date of May 2018.